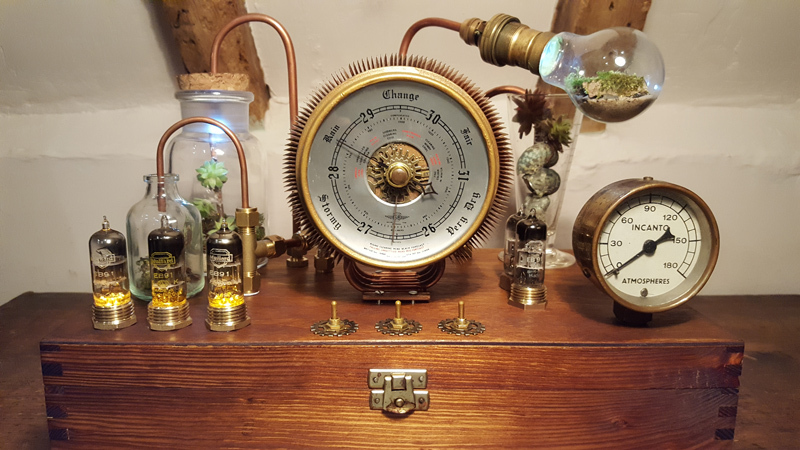 I'm nearing completion of my first Steampunk project - The Prognosticator. It's connected to my computer via bluetooth, allowing the lights and dial positions to be controlled programmatically. I'm planning to connect it to the internet to display information in real time, although I'm stuck on ideas on the information it should show! Once I have an idea on what is should display, I'll make the appropriate central dial (and write some code to read the appropriate events/information from the net). I'd welcome any feedback and ideas. I had it partially working for the UK General election - displaying election results as they came in. At some point I'd like to make it truly prognostic, using algorithms/AI to predict events! It looks amazing, but not enough pictures because we can't see all the little things in the glass bottles etc. What is at the back? What is in the light bulb? Wanna see, wanna see! I love the box and the brass toggle switches. Very well put together. Thanks! I'll add some close ups of the glass vessels etc. They contain air plants, succulents and moss on a substrate of dried sand from a woodland floor. I chose the plants so they don't need much water (which would fog up the glass) - although I would like to setup something to drip feed them through the pipes occasionally. Was thinking of a more biology lab project next - maybe an orchid terrarium, with appropriate steampunk measuring/feeding equipment. The Prognosticator is truly a thing of beauty. As to its use - given the nature of the central dial, wouldn't displaying weather conditions be an suitable choice? And if you were tapping into a forecast then it would be showing a prediction of the future.